There’s a long blog post coming on MachaWorks, which I visited yesterday, but today’s thoughts are all about Kalomo. The town is about 10km from Simakakata, and last time I visited was little more than a truck stop on the road from Lusaka to Livingstone. Even though it’s Sunday, and most of the shops are closed, things do feel different. There are signs that people have more money – there are more places to eat, for a start, and two new banks have opened here with a third on its way. 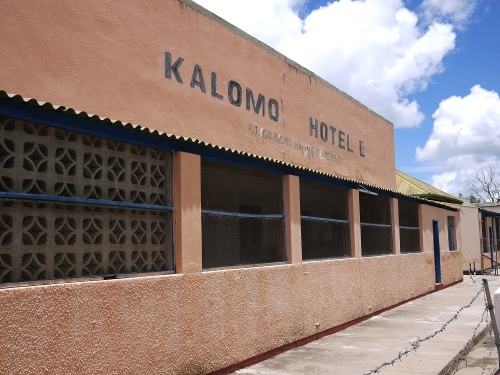 18 months ago, there were no cash machines in Kalomo. Now there are two, and a new health centre in the town. I spent most of this evening talking to the Assistant District Commissioner – the highest ranking non-political civil servant in the area – who told me that there are several new housing projects underway already, with plans for more. He hopes that soon he’ll be able to attract one of the big supermarket chains to invest in Kalomo too. Some of the new developments have been funded by international donors, he says, but more importantly private investors have begun projects in the area too. A big driver for change has been the arrival of 18 farmers who lost their land in Zimbabwe. Encouraged to settle here by the government, they’ve begun producing cash crops like tobacco and coffee – as well as staples like maize. Wages have risen, and new farming techniques have been introduced to the area with greater yields. There’s a long way to go for Kalomo and the cost of living has has also gone up – petrol and the price of a portion of sausage and chips are almost on a par with the UK, and the hotel rates have gone up too – but it’s a privilege to see this kind of development in action. With more new roads on their way (more about this in the next post) and even a nascent tourist industry based around the town’s heritage as the colonial capital of the country. Will visitors to Zambia be booking a holiday in Kalomo rather than Livvingstone some time soon? Not many, but perhaps enough.